KUALA LUMPUR: MyIPO, an agency under the purview of the Domestic Trade, Cooperatives and Consumerism Ministry, is taking another giant step in enhancing local intellectual property (IP) valuation. The agency is offering further training to valuers who have successfully undergone the IP Valuation beginners training last year. The enhancement training is offered to all 23 participants who passed the beginners IP valuation examination. 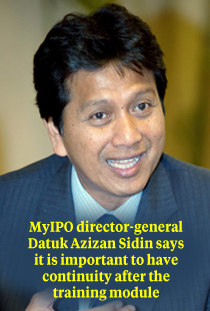 MyIPO director-general Datuk Azizan Mohamad Sidin said the hands-on training is to ensure that each participant is able to draft and prepare an IP valuation report based on the IP Valuation Model launched last year. The enhancement training is divided into two sessions – March 24 to April 5 and April 15 to April 25. Azizan said it is important to have continuity after the training module that was launched early last year. More than 50 participants underwent comprehensive IP training. MyIPO’s various programmes and initiatives for the past one year were aimed at creating a conducive and sustainable IP ecosystem to enable businesses and entrepreneurs to unlock the commercial value of their knowledge and intangible assets beyond the traditional use of IP as a protective business strategy. Meanwhile, the intensive enhancement training is conducted by Intangible Business Ltd, a UK-based IP valuation company. The enhancement training is designed to ensure that the training is carried out in a more systematic, practical and effective manner. The IP valuation enhancement training, organised by MyIPO, is being held at MyIPO’s IP Training Centre in Bangsar, Kuala Lumpur. MyIPO is responsible for the development and administration of intellectual property rights system in Malaysia. The agency has also been tasked to provide strong legal infrastructure and an effective administrative regime to enhance greater creativity and exploitation of IP.